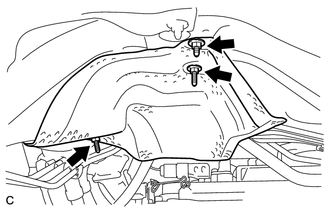 (a) Remove the 3 nuts and front No. 1 floor heat insulator. (a) Remove the clip and disconnect the transmission control cable assembly from the No. 1 control cable bracket. (b) Remove the nut and transmission control cable assembly from the transmission control shaft lever. 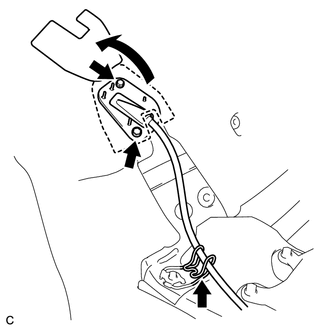 (c) Disconnect the transmission control cable assembly from the No. 2 transmission control cable bracket. (d) Turn back the carpet. 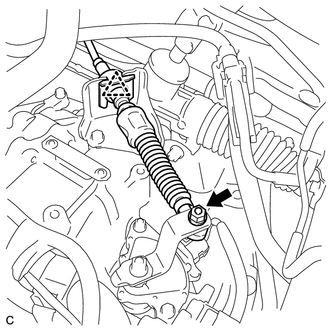 (e) Remove the 2 bolts and pull out the transmission control cable assembly from the body.